Richard, born at Worstead, Norfolk, on 24 November 1824, was the youngest of Phoebe (née Barcham) and Jacob Shalders’ children. He worked for his father in the grocers and drapery shop on Church Plain, Worstead, before going to London in 1840, at the age of 16. At the age of 27, Richard married Eliza Rooke at the Baptist Chapel, Meeting Hill on or just before 30 September 1851 [Lynn Advertiser marriage notice]. Eliza, who had first met Richard at Dover, was the eldest daughter of Henry Rooke a builder in Ventnor, Isle of Wight. According to Richard’s diary, shortly before emigrating he: ‘visited with my betrothed her friends in the Isle of Wight to take farewell. I then sent my betrothed to my home in Worstead, Norfolk, to get acquainted with my friends. After some days, I proceeded there also. We were then married at the Baptist Chapel, Worstead, and were welcomed back to my village by a peal of bells from the old church steeple [presumably St Mary’s, which has a tower]. Three days later we took farewells of my friends and finally left England in a barque, the Katherine Stewart Forbes.’ Richard and Eliza sailed from Gravesend on 19 October 1851, reaching Auckland on 9 March 1852. The passage took 140 days. The barque almost foundered off North Cape, New Zealand, during a terrific storm. Although the YMCA did not begin in Auckland until 1855, Richard began holding ‘Youth’s Scripture Conversational Classes . . .Tea will be provided (gratis) the first Sabbath in each month’, starting with six youths at his home on Queen Street every Sunday afternoon and later at his new home on Chapel Street, somewhat further up Queen Street. When attendance increased to 30 the accommodation became too crowded, and so the young men built an addition to the house. A collection raised [pounds] 200 during the meeting; a site was purchased on Durham Street East [nearly opposite Richard’s business premises at 200 Queen Street], where a very comfortable home-like building was erected. The rooms were opened on Friday 12 September 1856 by His Excellency Governor George Brown. There was a circulating library and a long table with periodicals to amuse and instruct. Light refreshments were provided. Young men used the YMCA as a place to meet; the average daily attendance was more than 50. [from Early History of the Auckland Young Men’s Christian Association]. A new wooden building, built in 1886 for (pounds) 7,500, on the corner of Albert and Wellesley Streets served for 19 years until it was demolished and a grand new building was erected on the site in 1886 at a cost of (pounds) 30,000. The present, modern YMCA building is on the west side of Queen Street, a short distance down from Karangahape Road. We received some information about The Duchess of Worstead: she was born and bred in Worstead, married Arthur Loads, brother of Fred Loads, of radio gardening fame, in the first World War and had two sons. She always seemed to attract attention, maybe because she dressed flamboyantly and had a blacked out lens in her glasses. She enjoyed playing the piano in the New Inn. He was born at Brockley Farm, Worstead in 1850. He was named Frederick Robert Tuck Cross but dropped the name Frederick. His father died in 1861. At the age of 25, married with two sons he was living at Westwick owning some land. Before that age he had studied Astrology, and taught the subject and made predictions which he sold and he started writing an Almanac. He returned to Worstead when he bought Lyngate Cottage for £440. He made alterations and grew and sold exotic plants especially orchids which were sent to London. He built 8 greenhouses in the field to the East of the Cottage and grew and sold different fruit and vegetables which were sent to markets in the midlands and further north. He was elected by the largest number of votes to the first Parish Council in December 1894. He served as Church Warden for a number of years. He also served on the Coal Board, which gave coal to deserving people during the winter. In the field he erected a weather station, recording wind direction and speed, sun shine and temperature at different levels as well as rainfall. He owned some of the first motor vehicles in the county starting with a Trike, then steam driven cars and eventually with the petrol driven cars. He was instrumental, with Mr G.Buck in obtaining the War Memorial in the Church and in l922 he bought the land for the Cemetry which he then gave to the Parish, Mr Buck donating the oak gates, which have since been replaced. Grandmother gave the “hearse” which is in the church. To the two boys there was one girl and my father with several still births during the 1880’s. This information was obtained from the family diaries from 1875, which I am holding as senior living descendant. – Uncle Sam and Aunt Polly with family. On checking the family tree data, this is Samuel Myhill (born about 1857 Dilham, Norfolk) and wife Mary Watts (born about 1855 Worstead, Norfolk). 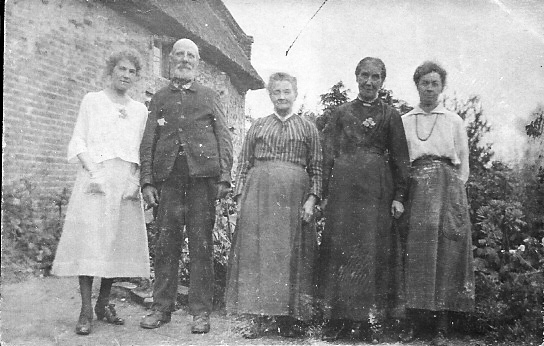 Mary is sister of Nellie (Ellen) Watts, my great grandmother, also in the first picture, second from right (born 1852 Worstead). Sam is an ‘ag lab’ in the census returns but is more specifically described in 1901 as Yardman on farm (Laceys Farm), then 1911 as Cowman. Only four of the people were identified in the caption in the photo album – “Ethel, Uncle Sam, Aunt Polly, mother Nellie”. I did wonder whether mother and Nellie might be two people, but of course as the caption was written by gran – Emily Neal – she hadn’t bothered to identify herself, the last one on the right. I was also fooled by her expression, not one that is seen elsewhere! The young women on the left is her niece* Ethel Williams, born 1898 Norwich. She’s eight years younger than gran (also born Norwich) but the two of them appear together often in the photo collection. I have just noticed they shared a birthday – 15th November. 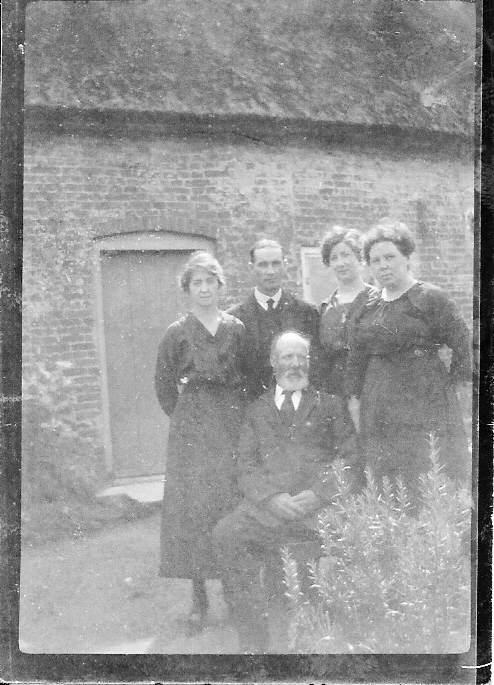 Photo two features the children of Sam and Polly Myhill – Laura (Anne Laura born 1883 Dilham), Syd (Sidney Frederick b 1888 Dilham), Emma (Emma Sarah b 1886 Dilham) and Kate (Katie Jane Watts, b 1875 Worstead, so possibly not Sam’s child as the couple married 1879). Mary Ann Elizabeth, born 1879 Worstead, is missing – last seen in 1901 census visiting in Tottenham London (although that’s only a possible record for her, not definite). Place of photographs presumed to be Worstead, outside Sam and Polly’s cottage – 1911 census gives this as Lyngate. Date: a few years before gran married in 1919. This article was sent to the Parish Council by John Howes,[email protected] and he would llike to hear from anybody who rcan identify the building in the background.